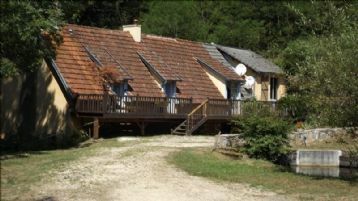 Property for sale in Auvergne-Rhône-Alpes. Properties in Auvergne-Rhône-Alpes, France. The green, volcanic peaks of the Auvergne represent one of Europe's most unusual landscapes. Pastoral in character, this mountain region has much to offer in terms of impressive natural scenery, as well as old, romantic sites with hot springs and a typical style of church architecture. The extinct volcanoes of the Auvergne, with the close to 6200ft-high Puys, form the core of the Massif Central. Inaccessible for many years, the region is one of the economic problem zones of France, with the departements of Allier and Cantal particularly prone to migration to urban areas. Largely deforested, the mountainous, sparse terrain and bitter climate are not conducive to intensive agriculture, and dairy farming predominates. The famous cheeses Fourme d'Ambert, Cantal and St-Nectaire come from the region. In the few larger towns, such as Clermont-Ferrand, Le Puy, Moulins, Montlucon and Aurillac, some important industries have been established. In the Auvergne, activities like hiking, cycling, kayaking and paragliding ae popular whilst a wide range of Gites Ruraux and Gites d'Etape provide the infrastructure.